Full of spellbinding menace and told in Ruth Ware’s signature suspenseful style, this is an unputdownable thriller from the Agatha Christie of our time. Ruth Ware worked as a waitress, a bookseller, a teacher of English as a foreign language, and a press officer before settling down as a full-time writer. She now lives with her family in Sussex, on the south coast of England. She is the #1 The New York Times bestselling author of In a Dark, Dark Wood, The Woman in Cabin 10, The Lying Game, and The Death of Mrs. Westaway. Visit her at RuthWare.com or follow her on Twitter @RuthWareWriter. "Ruth Ware is a magician. Her novels—suspenseful, sophisticated, relentlessly compelling—blow the dust off half a dozen crime genres, from Golden Age whodunits to psychological suspense. And The Death of Mrs. Westaway, her latest, is also her best: a dark and dramatic thriller, part murder mystery, part family drama, altogether riveting. More, please, and soon." "A classic never goes out of style. Consider the confident simplicity of the dry martini, the Edison lightbulb and Meghan Markle’s wedding dress. Now, add to that list Ruth Ware’s new novel, The Death of Mrs. Westaway… a perfectly executed suspense tale very much in the mode of Daphne du Maurier’s Rebecca." "[A] captivating and eerie page-turner." "Ware's novels continue to evoke comparison to Agatha Christie; they certainly have that classic flavor despite the contemporary settings. Expertly paced, expertly crafted." 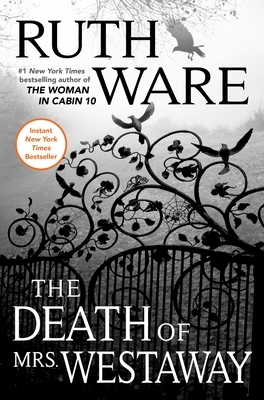 "Ware, who, with a run of acclaimed thrillers, including The Lying Game (2017), has established herself as one of today’s most popular suspense writers, twists the knife quite expertly here… The labyrinth Ware has devised here is much more winding than expected, with reveals even on the final pages… a clever heroine and an atmospheric setting, accented by wisps of meaning that drift from the tarot cards." "Evocative prose, artfully shaded characters, and a creepy, claustrophobic atmosphere keep the pages of this explosive family drama turning." "This British writer knows how to hook crime-novel/psychological suspense fans." "I’ve adored Ruth Ware’s work for some time, ever since I picked up her first playful puzzler of a mystery, In a Dark, Dark Wood. She’s been making her way through classic mystery settings, making each her own, and her new volume promises to continue the trend, in a tale of a con artist headed to a family funeral that promises to be the most entertaining fictional British burial since the film Death at a Funeral first graced our screens." "Fans of The Woman in Cabin 10, rejoice. Ruth Ware is bringing you another page-turning tale of suspense... Thrilling and clever, The Death of Mrs. Westaway will be hard to put down." "The best-selling writer of psychological thrillers (In a Dark, Dark Wood and The Woman in Cabin 10) has a new winner… the situation grows increasingly complicated and creepy, Agatha Christie-style." "Ruth Ware’s master storytelling again sets readers on edge." "Ruth Ware continues making a name for herself in the suspense genre with her Agatha Christie-esque novel, The Death of Mrs. Westaway." "Ruth Ware continues to revitalize the traditional mystery for millennial audiences in The Death of Mrs. Westaway, for another mystery that functions both as tribute to the genre’s tropes and a playful revisioning of the drawing room mystery." "If you’ve been pining away for a first-rate gothic murder mystery for the past 40-odd years since Agatha Christie’s passing, hie yourself to your local (or online) book vendor for Ruth Ware’s The Death of Mrs. Westaway. It has everything you’re looking for… Atmospheric and twisting in a very Christie-like manner (manor? ), The Death of Mrs. Westaway is guaranteed to keep you flipping pages well past your bedtime." "Ruth Ware has written another gripping thriller... Creepy and atmospheric, The Death of Mrs. Westaway will keep readers on the edge of their seats. Ware spins a convincing web of intrigue and tension."